An all-new mobile game titled Crimson: Steam Pirates developed by some of the folks behind the uber-popular Halo series of science-fiction action video games has been released on the iPad today. The game has been developed by the recently set up Bungie Aerospace which is the mobile/social arm of Bungie, Inc. (the folks who are known for the Halo series). The aim of Bungie Aerospace is to provide a platform for independent developers to launch their innovative mobile and social games. 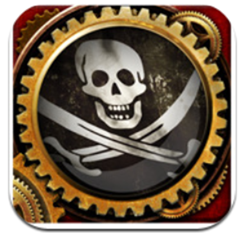 Their first product is called Crimson: Steam Pirates and it has been released today. We first heard about this game back in May when it was reported that Bungie had filed for a trademark for “Crimson” related to ‘a computer game software for use on mobile and cellular phones’. 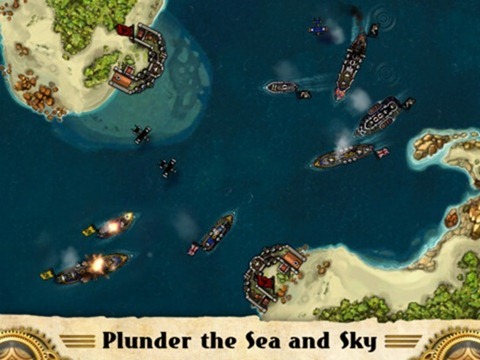 Crimson: Steam Pirates is a turn-based action strategy game in which you are tasked with commanding a fleet of ships, submarines, airships along with different types of crew in order to fight against similarly equipped enemies. The game comes with multiplayer which, unfortunately, is limited to pass-and-play instead of real-time multiplayer which – we hope – will be included in the future. Besides this, Bungie’s legendary stats-tracking system is included along with integration with Facebook. Command your fleet and your Steampunk crew using an elegant action interface. 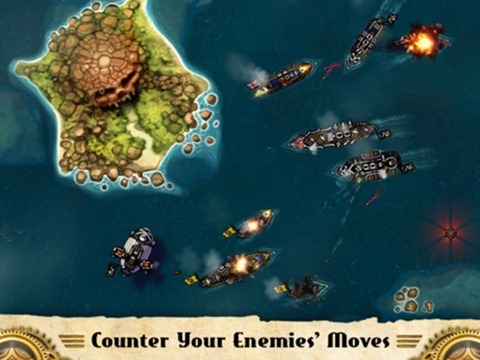 Crimson: Steam Pirates’ turn-based gameplay provides an addicting mixture of strategy and action as you anticipate your enemies’ moves and counter them, luring them into a deadly hail of weapons fire while uncovering the mystery brewing in the Caribbean. The game is episode-based in that there will be a total of 8 episodes (or voyages, as they are called in-game) with the first one being released today. The first eight missions in today’s episode are free and the others can be unlocked via in-app purchases as they are released. Each episode costs $1.99. The game is compatible with the iPad on iOS 4.2 or later. You can download it from the link embedded below.